Expansive wraparound deck and two fireplaces surrounded by scenic views. The Overlook at Neachen Bay is a fantastic lakefront getaway with a plethora of features indoors and out. 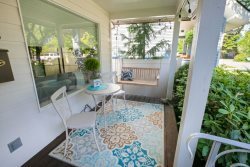 This home can be easily accessed by both car and boat, but the quickest way to reach downtown Coeur d’Alene is via boat. When you’re not cruising around the lake you can tie up at your own private dock. This massive cabin has a grand, yet welcoming feel. Gorgeous wooden features throughout add to the luxury meets rustic vibe. You’ll be drawn to the stunning views of Lake Coeur d’Alene and the surrounding mountains through the many large windows. With wooden vaulted ceilings, the living room’s centerpiece is the two-story stone fireplace with a wood burning stove. In this area you’ll also find plenty of comfortable seating, a TV, work desk and even a spotting scope to get a closer view of the area’s wildlife. What’s on the other side of the stone fireplace? Another fireplace, of course! This second wood-burning stove is right next to the dining area and kitchen. Surrounded by windows and lake views, you’ll enjoy meals at a wooden table with seating for 6. The adjacent fully stocked kitchen has long countertops, an island with seating for 4 and even more lake views to enjoy while you prepare delicious meals. The main level master bedroom has a queen bed and attached bathroom with a shower/tub. Upstairs, there are two more bedrooms with queens and another bathroom with a shower/tub. As incredible as the inside is, you’ll probably spend much of your time enjoying the spectacular outdoor area. Encircling the home is a huge wraparound porch stocked with tables, chairs—including a swinging bench—and a BBQ. A path takes you down at the waterfront where you’ll enjoy your own private dock with a boat slip. Please be advised that this path does include a few steep sections. Soak up sunshine and North Idaho rustic charm in this beautiful cabin by the water.